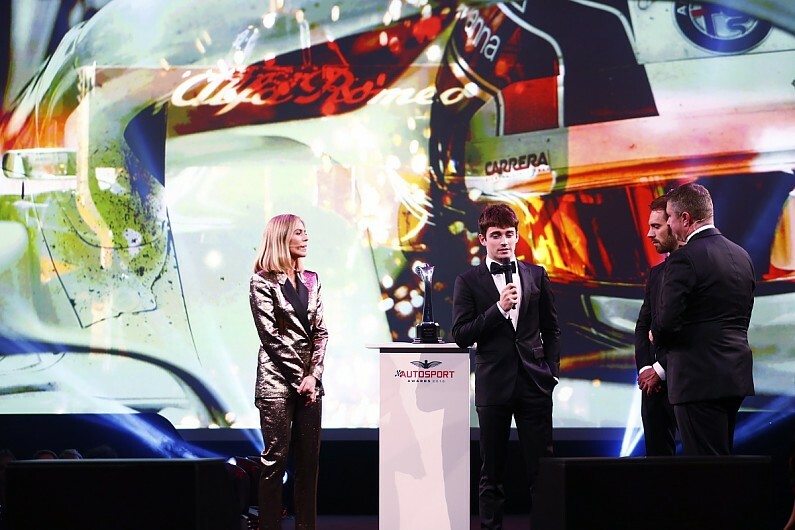 Future Ferrari Formula 1 driver Charles Leclerc has won the Richard Mille Rookie of the Year title at the 2018 Autosport Awards. He makes it back-to-back victories of the award, which is decided by readers' votes, having first won it off the back of his dominant Formula 2 success in 2017. Leclerc then had a stunning breakthrough F1 season at Sauber in 2018. A slow start to his first year at the highest level was banished with a sixth place finish in the Azerbaijan Grand Prix and he scored points in a further nine grands prix to earn a graduation to Ferrari. Leclerc has played a key role in Sauber's resurgence in 2018 and beat experienced team-mate Marcus Ericsson convincingly across the campaign. His award was presented to him by Formula E champion Jean-Eric Vergne. "It has been a great season," said Leclerc. "I did not expect it to be so positive or the promotion. "That is quite crazy and I don't quite fully realise what is happening. "The first the three races were quite difficult, a lot to learn and new things. "After that it went smooth and it was a great year and it was not positive without a great team behind me unlocking the car. "We finished the year quite regularly in Q3 and it is all down to the team. "I am really looking forward to the challenges in the next few years." Leclerc also spoke about his new team-mate for 2019, Sebastian Vettel. "I will have a lot to learn, it is totally new for me and it is quite a big leap," said Leclerc. "It is an honour to have a champion like him alongside me." The Monegasque driver won the award ahead of IndyCar rookie Robert Wickens, F1 rival Pierre Gasly, FE star Andre Lotterer and 2018 F2 rivals George Russell and Lando Norris.